Hotel was renovated in 2011. 6-storey building with 2 lifts. The hotel disposes with outdoor pool, children’s outdoor pool, main restaurant with terrace, a-la-carte restaurant, lobby bar, pool bar, reception with safety boxes (extra charge), lounge, exchange office, rent-a-car, free Wi-fi at the Lobby, laundry services. With a stay at Berlin Golden Beach in Golden Sands, you'll be a 3-minute walk from Golden Sands Beach and 6 minutes by foot from Nirvana Beach. This hotel is 10.6 mi (17 km) from Sea Garden and 3.4 mi (5.4 km) from Aladzha Monastery. Enjoy international cuisine at Arabella, one of the resort's many dining establishments, which include 5 restaurants and a coffee shop/café. Relax with a refreshing drink from the poolside bar or one of the 2 bars/lounges. A complimentary buffet breakfast is served daily from 7:30 AM to noon. 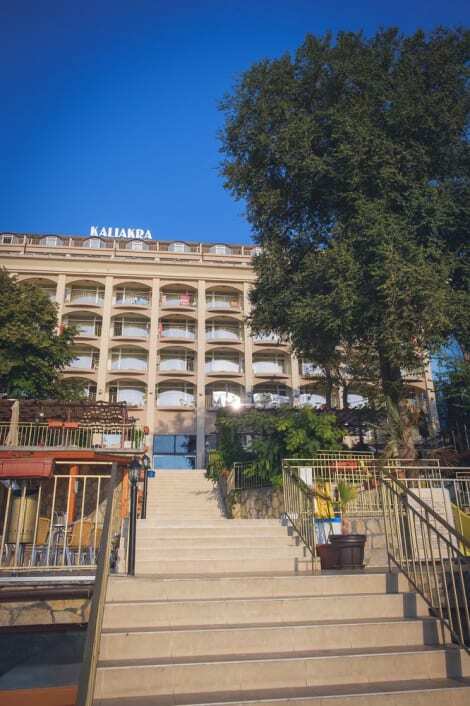 With a stay at Kaliakra Palace - All Inclusive in Golden Sands, you'll be on the beach, within a 10-minute drive of Golden Sands Beach and Nirvana Beach. This 4-star hotel is 9.8 mi (15.8 km) from Sea Garden and 2.6 mi (4.3 km) from Aladzha Monastery.